The Obama administration declined to comment on Sunday on provocative state-run Chinese media reports outlining Beijing’s nuclear war plans, including land-based and submarine-launched missile strikes on U.S. cities that would kill up to 12 million people. State Department spokeswoman Marie Harf and Pentagon spokeswoman Cynthia Smith would not respond when asked about the highly unusual Chinese reports published Oct. 28 in numerous major Communist Party-controlled television and newspaper outlets. The Chinese reports included maps showing nuclear strikes on Los Angeles and the Pacific Northwest, along with the resulting radiation plumes stretching thousands of miles across the western United States. Global Times, viewed as China’s most xenophobic anti-U.S. media outlet, stated in its report that “the 12 JL-2 [submarine-launched ballistic missile] nuclear warheads carried by one single Type 094 SSBN can kill and wound 5 million to 12 million Americans.” The newspaper is a subsidiary of the People’s Daily, the organ of the Central Committee of the Chinese Communist Party. Harf referred questions about the attack scenarios to the Pentagon, where Smith would not comment directly, despite the fact that a key mission of the Pentagon is to deter nuclear attacks like those outlined in the Chinese press. “We continue to monitor these development very closely,” she said. The Chinese nuclear saber rattling is expected to complicate the administration’s push for a new round of strategic arms cuts with Russia. President Barack Obama in June repeated his call for ultimately eliminating all nuclear weapons and called for a one-third cut in the projected New START arms treaty warhead level of 1,550 warheads. However, Russia has balked at further cuts and is developing a new medium-range nuclear missile partly as a result of China’s growing arsenal of nuclear missiles. China is rapidly expanding its nuclear forces with new missiles, submarines, and warheads. At least one of the warheads is based on warhead designs stolen from U.S. nuclear weapons laboratories in the 1990s, U.S. officials have said. The Chinese reports last week stated that the nuclear forces revelations were the first time Chinese media had discussed detailed plans to counter U.S. nuclear deterrence in the Pacific. Previously, details of China’s nuclear forces were among the most closely guarded secrets in the Chinese military. In addition to Global Times, the reports also appeared in other Party organs, including China Central TV, People’s Daily, PLA Daily, China Youth Daily, and Guangmin Daily newspapers. The reports were unique due to the level of threatening rhetoric and rare public discussion of plans for nuclear attacks, including plans to fire road-mobile DF-31A road-mobile long-range missiles over the North Pole to attack U.S. cities. The missile has a range of up to 7,500 miles. “If we launch our DF-31A ICBMs over the North Pole, we can easily destroy a whole list of metropolises on the East Coast and the New England region of the U.S., including Annapolis, Philadelphia, New York, Boston, Portland, Baltimore, and Norfolk, whose population account accounts for about one eighth of America’s total residents,” Global Times stated. For submarine-launched nuclear missiles, the Chinese plan to target key west coast cities. “Because the Midwest states of the U.S. are sparsely populated, in order to increase the lethality, [our] nuclear attacks should mainly target the key cities on the West Coast of the United States, such as Seattle, Los Angles, San Francisco, and San Diego,” Global Times said. One graphic showed eight warheads hitting Washington state and Oregon and the nuclear radiation spreading as far east as Chicago. Another map shows five nuclear warhead destruction radii in downtown Los Angeles. The Chinese nuclear war stories were first disclosed by the Washington Times on Thursday. “While there’s no doubt Beijing’s media coverage of China’s nuclear missile submarines is aimed at psyching out Washington, the real targets of this new nuclear propaganda are Japan, India, and the South China Sea states, all of which place heavy reliance on their relations with the United States in balancing China,” Tkacik said. The failure to respond to the threats is undermining the confidence among U.S. allies and friends in Asia concerned with the American commitment to protecting Asia. However, Beijing appears to be calculating that U.S. war weariness will lead to further slashed budgets for counter-nuclear programs, anti-submarine warfare, and missile defense, he said. “Even with deliberately provocative articles like this series of reports on China’s nuclear missile submarines and targeting American cities, the general inclination inside the beltway is to treat China as a friend. I just don’t understand it,” Tkacik said. Richard Fisher, a Chinese military affairs expert, also said the propaganda highlighting nuclear strikes on the United States appears part of Beijing’s calculated strategy to stoke nationalism and military worship in China. One of the graphics published showed patrol areas southeast of Taiwan where new Type 094 ballistic missile submarines will conduct patrols. 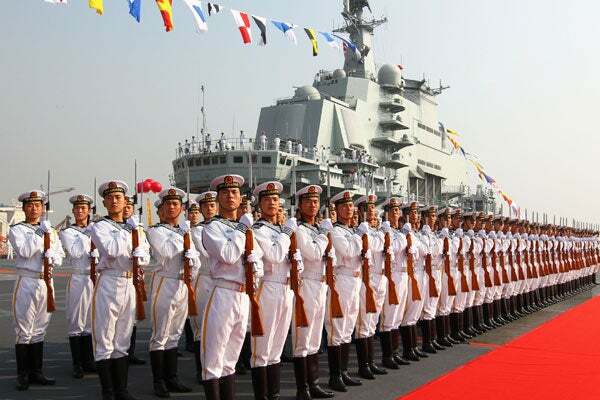 Fisher said China’s large-scale Maneuver 5 war games last week included submarine, surface ship, and bomber exercises. “Could the PLA Navy be starting to practice [missile submarine] operations to support the deployment of their nuclear missiles submarines [set to begin next year]?” Fisher said. Fisher also said the nuclear war reports and estimates of killing Americans may be linked to Chinese pique at the United States over the late-night ABC comedy show “Jimmy Kimmel Live.” A recent unscripted segment on the show featured children answering questions and one boy suggested that the U.S. response to China should be to “kill all the Chinese.” ABC later apologized for the segment. Also last week, China’s military released a feature-length film that accused the U.S. government of subverting China’s communist system and imposing American values. The military film said the Pentagon was using military-to-military exchanges for those ends and to corrupt Chinese military officers who take part in the exchanges. The film, titled “Silent Contest” also criticized western non-governmental groups, exiled Tibetan leader the Dalai Lama and Uighur human rights activist Rebyia Kadeer. Groups singled out as subversive included the Carter Center, the Asia Foundation, the International Republican Institute and the Ford Foundation who are behind an “America’s cultural invasion” of China. The New York Times first reported on the film Oct. 31.